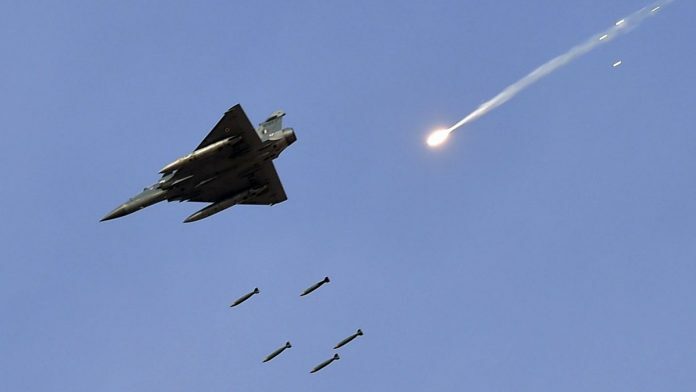 Five Mirage 2000 aircraft of the IAF crossed over the LoC and went at least 10 km inside PoK, before firing multiple Spice-2000 precision-guided bombs that hit the sprawling Jaish-e-Mohammed training camp in Balakot Tuesday, reports Snehesh Alex Philip. Narendra Modi’s well-rehearsed pattern goes something like this — let bigotry gain legs, the poison seep in, let the sane and insane headbutt on every platform first, writes Rama Lakshmi. According to the IAF, patrolling aircraft are rotated based on various factors, and at the time when the Pakistani F-16s attacked Wednesday, it was the MiG-21’s turn, reports Snehesh Alex Philip. Using Foreign Secretary Vijay Gokhale’s description of the target, ThePrint accessed satellite imagery to find the possible location of the IAF strikes, writes Col. Vinayak Bhat (Retd). Going ahead, Pakistan and the global community will have to keep the redefined red lines in mind. There will be an Indian military response to terror strikes coming from Pakistan, writes Shekhar Gupta. The contrast in Prime Minister Narendra Modi and Congress president Rahul Gandhi’s speeches Tuesday delineated the battle lines for the coming Lok Sabha elections, writes D.K. Singh. Pakistan has lost a lot over the past five decades, including its pre-eminence in the Islamic world, Shekhar Gupta notes in this week’s National Interest, with some advice for Prime Minister Imran Khan.